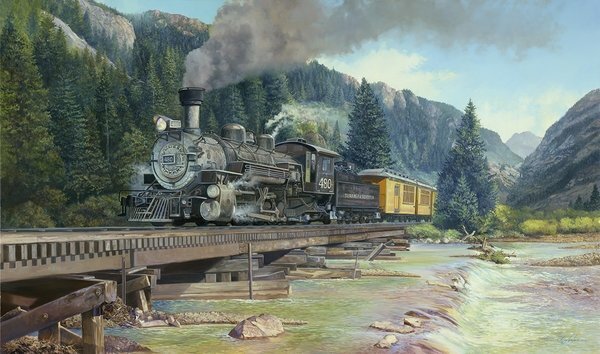 Image size is 14" x 24"
Ole Engine number 480 is building a head of steam as the locomotive and passenger cars cross the Animas River at Timber Bridge. This newest painting is my first work depicting the great steam locomotives of the past. The Durango & Silverton Narrow Gauge Railroad (D&SNG) is a narrow gauge heritage railroad that operates 45.2 miles of track between Durango and Silverton, Colorado. The route was originally opened in 1882 by the Denver & Rio Grande Railway to transport silver and gold ore mined from the San Juan Mountains. The line was an extension of the narrow gauge line from Antonito, Colorado to Durango. The last train to operate into Durango from the east was on December 6, 1968. The states of New Mexico and Colorado purchased 64 miles between Antonito and Chama, New Mexico, in 1970 and operates today as the Cumbres & Toltec Scenic Railroad.